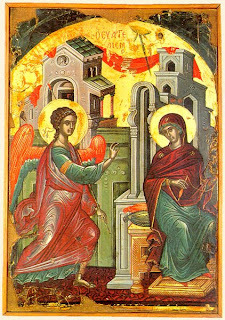 This icon of the Annunciation shows Our Lady holding a spindle. This relates to the "legend" in the Gospel of St. James that after being betrothed to Joseph, Mary was summoned to the temple, along with seven other virgins, to work on the new Temple Veil. This huge veil was woven in strips of four colours; blue, white, purple and red. Mary was chosen to work on the red and purple portions. These colours are thought to have represented fire and water (or perhaps blood and water?). The icon shows that as Mary was helping to weave the new Veil of the Temple, she was chosen to "weave" the Veil of Christ's Flesh in her body. The great Temple Veil came to symbolise the Incarnation. The veil was the border or boundary of the created world. Behind it lay the Holy of Holies which only the High Priest could enter. On the Day of Atonement, the great curtain was sprinkled with blood. When it needed to be cleaned, 300 priests had to lower it into the water. Eventually it had to be replaced. When the Lord Jesus died, this Veil was torn from top to bottom. The Great and Eternal High Priest had not gone behind the curtain but "through" it. The new Veil was His Body which was opened on the Cross by the lance. Out of that wound flowed blood and water, the "Fountain of Sacramental Life" (Preface of the Sacred Heart). This day is also a special day to pray for an end to abortion. I have argued before that this Solemnity should be a world-wide Holyday of Obligation, recognising the great gift of life at conception. These days we need to nail our colours to the mast as pro-life Christians. The exaltation of this Feast would help us; it would be a signal to everyone that the Catholic Church remains firm in the belief that human life begins at conception.